Post subject: Re: Rapid build or bust. Its starting to take shape. I trimmed the legs down. To get it level i stacked up timber off cuts until I was happy with the working height. I then used the stack of timber as a scribe line. Easy way to get the right angle! I finished the grill plate. I cant get expand metal around here. So i improvised with 10mm bar at 10mm spacings. I used off cuts as spacers and two lengths of rod as the frame. It turned out pretty good i think. Also pics of my improvised cutting jig for the grill and 'welding bench'. I ended up, cutting an old pizza tray to block off the old flue holes. They are just tacked on for now. After they are welded on and buffed with a flap wheel they should look ok.
One of the problems with my first smoker was the fire was too far from the grill for cooking snags and steaks. 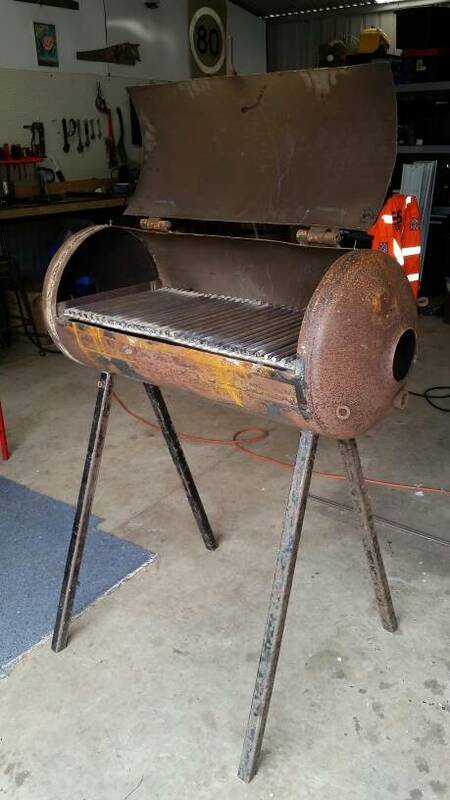 So for this one i added brackets so the height can be adjusted to suit the cook. Low for smoking and high for grilling. The steel i had for the free tray was a bit flimsy so i added some round stock to that, it should hold up to the heat now. I finally found the offcut of 3" exhaust so I can do the chimney. Then i think that will do for now. All that is left is handels, wire weeling the whole thing and painting with black high temp. I'm loving it. But dayum, those legs look a bit like they'd collapse. The legs are so solid I would be confident to dance the funky chicken on the grill. How has she turned out? It turned out pretty much exactly as i expected. I didn't get it done that weekend so i have been chipping away at it once a week in 15 minute intervals. The chimney is on. That was a PITA trying to fit a round pipe to a concave surface. I got the first coat of paint on. The fire grate go a second layer. Its just the handle and a top coat to go. Not the best pic, that was during painting in my poor mans spray booth. After quite a few weeks of slow progress (5 minutes at a time ) it has come together. There aren't any majestic shots of pulled pork or brisket because winter has arrived and the rain has set in. I went for a few extras on this one. Axe handle because its cool. I made the fire grill height adjustable for different cooking styles. I made a grill lifting tool from a welding hammer. There is an open /close air vent on the back. The legs come off for transport. The flue might need trimming. I will know after the test fire. In the future i might add some handles to the sides and maybe a timber work bench. So now we are in a holding pattern until the 31st when this little stick burner has a date with a whole side of pork belly. Nice! I'm doing a UDS as my first build - no welding experience for me.